Genres clash, and faith and spirituality come face to face with international intrigue in this sequel to Bapsy Jain’s debut novel Lucky Everyday, originally published as The Blind Pilgrim. In her first novel, we met Lucky Boyle, an accountant and entrepreneur who takes a bizarre international journey that includes divorce, pregnancy, and false imprisonment. To her credit, she is spiritual, mindful, and generous, with a knack for finding missing people. 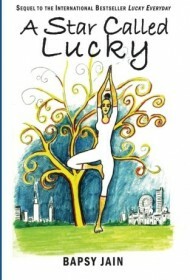 As the sequel opens, Lucky is still teaching yoga at a New York state prison, raising her son as a single mother, and dabbling in a romantic relationship. Things take a strange turn when she is recruited for a special mission by Clevis Coleman, a high-ranking government official who leads a shadowy task force within the Food and Drug Administration. A virulent influenza has emerged in Lucky’s native country, India. Coleman seeks Lucky’s help to find a Buddhist doctor living off the grid in Mumbai who is rumored to possess a mysterious “ice mushroom” that may help fight the influenza, as well as hold the key to a kind of immortality. To aid her, Lucky recruits a a former soldier-turned-PETA-activist and a 16-year-old hacker. Jain composes her mystery in clear, straightforward prose that moves the story forward but never grabs readers the way a story blending Eastern spirituality, international intrigue and terrorism might. That said, it reads easily, assuming readers are willing to take considerable leaps of faith concerning logic and plausibility, as well as ignore their genre expectations. Lucky’s frequent meditations on self-enlightenment sound closer to Eat, Pray, Love than a mystery novel, and the incongruity of sending a yoga teacher on a secret mission overseas is a stretch. The story’s closest analogy might be John Burdett’s series featuring thoughtful Buddhist detective Sonchai Jitpleecheep. While this won’t be everyone’s cup of tea, the unique nature of Jain’s conflicting elements may appeal to those seeking something completely different from the norm.